From a Mystikal press release: During the Thanksgiving weekend, Mystikal's snare line went into the studio of Musikvergnuegen in Hollywood, Calif., to record the snare track for Fox Sports' Bowl Championship Series (BCS) commercial. This soundtrack will be played throughout the month of December leading up to the BCS championship game in January, 2007. 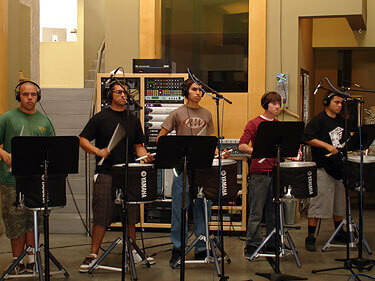 The line recorded three variations of the soundtrack: "Main Version," "Latin Version" and "Sentimental Version." The composer, Justin Burnett, was on-site to work with the members and made modifications to voicing of the soundtrack. Burnett was blown away at the professionalism of the members and how well they adapted to playing with headphones and being unable to hear each other. Executive producer, Pat Weaver, was so pleased with the talent of the ensemble, that he has contracted Mystikal to have the entire field ensemble record traditional drum corps cadences.